Best Chainsaw Reviews & Ratings - Gas, Cordless and Electric Covered. 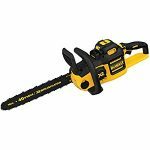 Best Chainsaw Reviews & Ratings – Gas, Cordless and Electric Covered. 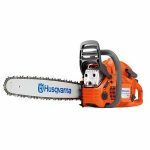 The Gas Powered Husqvarna ChainSaw is backed with a 2 year warranty & 4.7 overall ratings. Chainsaws are a powerful mechanical saw that was first built as a medical tool for doctors to use to saw through bones, but you don’t want to read about that. Now they’re ideal for the Lumberjacks of the world that want to cut timber down effortlessly. 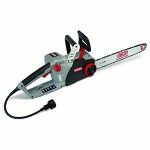 Chainsaws are ideal for pruning, bucking, cutting, tree felling and much more. It can be gas powered, use hydraulic power, compressed air or electricity. Many artistic people use this machinery to make chainsaw art. Whatever the purpose for you needing a chainsaw allow us to help you make that final decision on the best chainsaw available in today’s market unless of course…. 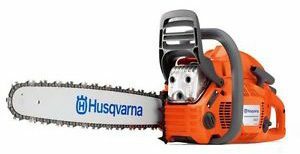 Here is the Husqvarna 966048324 460 24-Inch 60cc Rancher Chain Saw that is powerful all around that is perfect for cutting jobs that are demanding and require more power. Loaded with X-Torq engine with a high torque over a wide rpm range. Users will enjoy its ergonomic design for effortless handling of the saw’s incredible power. It also features the Smart Start, LowVib, a combined choke/stop control and an Air Injection. Here are some pros and cons. Q – How well does it hold up to hardwoods like maples, oaks, and locust? A – Works like a beast! You may have to sharpen the chains every so often if cutting through hardwood, but it’s a fantastic cutter. Q – Is it ready to use out of the box after assembly? Any adjustments, idle or running speed need to be done? A – Put the chain and bar on oil, and you’re ready for timber action! Q – Does it include the bar and chain? A – Yes! It has a bar, chain, and chain guard. 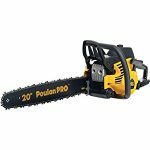 Here is the Poulan Pro PP5020AV 20-Inch 50cc 2 Stroke Gas Powered Chain Saw that cuts like a pro! Includes an easy pull start system designed to make startup quicker and reduce vibration handle fatigue. There is a tool-less access to the air filter and spark plug, an automatic chain oiler along with an on-board locking scrench holder for incredible handy features. Plus a convenient carrying case. Here are some pros and cons. 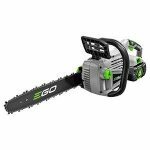 Q – Would you say it was comparable to the Craftsman 50cc 20″ Chainsaw? A – Practically identical, but this model has a better cylinder. Q – What size file do I need to sharpen the chain? 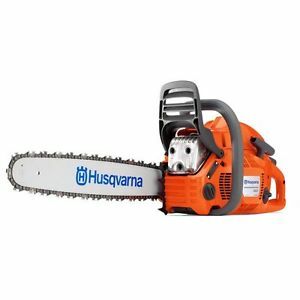 Q – What’s the difference between a Class A chainsaw and a Class B? A – Class A is not supposed to have any aesthetic imperfections, while B’s are allowed to have scuffs or blemishes. 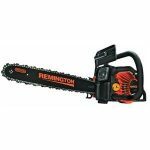 Here is the Remington RM5118R Rodeo 51cc 2-Cycle 18-Inch Gas Model that is hyped and ready to take on various tree limbs and cutting you can throw at it. Loaded with an anti-vibrations handle to take the “errrr” out of timber giving users a more comfortable handling reducing fatigue for all day cutting. The QuickStart technology will make pulling much easier along with the A-grade crankcase and sprocket for a more solid performance. Here are some pros and cons. Ideal gas chainsaws for cleaning up trees after bad storms, limbing and cutting firewood. Q – What size file is used to sharpen the chain? Q – Does this Remington 51cc 2-cycle come fully assembled out of the box? A – It does. Just add fuel and bar/chain oil, and you are ready for those trees. Q – Are you able to change out bar lengths? A – Yes. You can upgrade the bar on the chainsaw brand if it has the power to handle it, but not recommended in regards to the warranty as it may be voided. 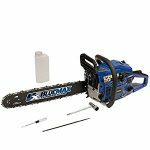 Here is the Blue Max 6595 18-Inch 45cc 2-Stroke Gas Powered Chain Saw a leading contender in performance, quality among fellow gas powered chainsaws. Uses an 18″ bar and chain and 45 ccs single cylinder. A no-load speed 2800 rpm and CDI ignition system. It also has a rapid-reaction kickback brake for a quick stop, safety trigger and a convenient on/off switch. Here are some pros and cons. 21 bp chain, 0055″ gauge, 0325″ pitch. Rapid-reaction kickback brake for quick stops, hand guard, and safety trigger. Q – How do you reset chain brake? A – Pull the hand guard back then brake releases and push forward chain then stops. Q – How much bar oil is needed? A – Keep oil in the reservoir each time the chainsaw is used as it is pertinent to the chain being able to move freely. The oil also prevents the wear and tear on the chain bar and chain. Always check the oil levels before use and drain the oil reservoir when storing it away for long periods of time. 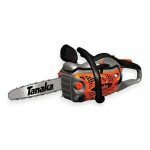 Here is the Tanaka TCSS33EDTP 14″ Top Handle Chainsaw has a Pure Fire Engine that is ideal for the commercial user such as shaping, pruning, etc. It features a 32.2cc 2-stroke that delivers ultra-low emissions, a clean and powerful performance that uses less fuel consumption. The Oregon chain with sprocket nose bar provides the user with better control for easier cuts. Here are some pros and cons. Q – Does it have a lanyard to hook on to when climbing? A – Yes. Test it out for added security measures before going up any tall ladders. Q – Does this saw have an oil adjustment screw? Q – What material is the crankcase made? Here is the Makita XCU02Z chainsaw with a 12″ guide bar delivering 150 FPM for rapid cutting speed without the extra noise. The cordless power tool gives out zero emissions and is lower maintenance compared to other models as it has no spark plug to replace, no muffler or air filter to clean and no engine oil to change increasing productivity. Load the 18V LXT Lithium-Ion batteries, and you’re ready to cut. Q – Will it run on just one battery or with two batteries? A – It needs two 18V batteries. Q – Does this model include a case? A – No. It does include a chain cover. 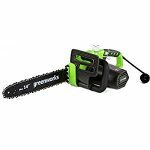 Here is the GreenWorks 20312 16″ Cordless Chainsaw delivering almost 30% more torque and an impressive 70% less vibration than the chainsaws that are gas-powered. The brushless technology extends the life of the motor with less noise and greater efficiency. Heavy-duty Oregon bar and chain with .0375 chain pitch, Metal bucking spikes, chain brake for quick stops. Higher productivity with the automatic chain oiler. Q – Does it include an automatic sharpener? Q – Is the trigger a fast/variable or an on/off kind? A – It is a variable. 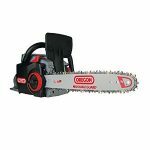 Here is the Oregon 40V Max CS300-A6 brand that is ideal for the commercial user and hardworking homeowner that needs a powerful battery-operated chainsaw that will get the job done. It runs quieter, cleaner with no need for cords or gasoline. It uses a Lithium-Ion no-fade power so you’re always ready to go. The brushless technology will cut 400 cuts in 2-3″ wood media. Q – Is the charger included? A – No, it came with a cover for the blade. Q – What’s the chain speed? Here is the Dewalt 40V Brushless perfect for many construction and landscape applications while running on a Lithium-Ion battery making it incredibly low maintenance and no need to breathe in fumes. You will not have to worry about spark plugs, air filters, and engine maintenance, etc. Charge the battery before each use, and you’re ready for cutting action. 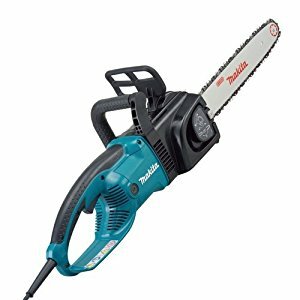 Q – Can the battery interchange from the chainsaw to the weed eater if both are the same amp hour? A – Yes. Batteries are interchangeable, and the A-hr (4.0 or 6.0) is just a capacity rating. If it is the same DeWalt 40v battery, the A-hr doesn’t matter. Q – Does it use any brand 16-inch chain? A – Yes. The standard Oregan 16″ chain found at any hardware store like Lowes and Home Depot. Q – Can I use this in all weather? A – Many people say they’ve used the chainsaw in all-weather, but Dewalt said it’s not recommended in the rain. Here is the EGO POWER+ 14″ Lithium-Ion Cordless model utilizing a high-efficiency brushless motor to provide the user with smooth and effortless cuts. The brushless motor also extends the runtime and the life of the tool. The 56V ARC Lithium battery delivers outstanding power and is compatible with all other EGO POWER+ products available. Q – What are the charger specs. How many watt inverters would I need to charge the battery from a pickup truck? A – Charger unit shows a power consumption rating of 210 watts. Here is the WORX WG304.1 18″ Electric model that is powerful but yet lightweight increasing productivity while reducing user fatigue. Ideal for quick and easy jobs such as cutting firewood, clearing brush, etc, without emitting harmful emissions with low-maintenance cost compared to a gas-powered chainsaw. Q – What is the smallest generator that will run this? A – It will pull 15-amps at 120 volts; therefore, the generator would have to produce at least 1800 watts. Q – What extension cord is needed? What outlet is required? A – 100-Feet 12AWG 15-Amp Indoor/Outdoor SJTW Power Extension Cable. A – It comes with chain cover. Here is the Makita UC4051A 16″ Electric model for highly-efficient cutting and trimming with a chain speed of 2900 FPM without the need for gas. The motor comes with a built-in current limiter that will protect the chainsaw from overload by reducing its power. It also includes a convenient automatic chain oiler for the continuous cutters and a large oil reservoir with a complete window view of the oil levels. The chainsaw has ergonomic rubberized grips and a large trigger for smooth start-ups. Q – Are the Oregon bars interchangeable? Can I increase the bar length to 20″ or possibly 24″? A – A couple of customers have reported increasing to 18″ and say it would work. 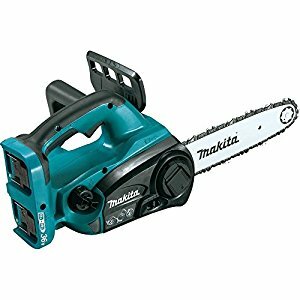 Q – Does this chainsaw have a metal gear drive? A – 1 Nylon, and 1 Metal. Here is the OREGON CS1500 Self-Sharpening Electric Chain Saw that is impressive with its exclusive self-sharpening chain the only one available due to its built-in PowerSharp sharpening system making it super convenient on any job site. It also has little noise and silent between cuts. Just pull the trigger and the electric chainsaw is ready for timber action. Q – Can this cut an 8-inch diameter dry/seasoned oak log? A – Yes! Lots of power in the electric chainsaw. Q – Are there longer compatible bars available? A – Just the 18″ bar. Q – What is the weight of the chainsaw? Here is the Black & Decker CS1518 18″ Corded model with a 15-amp motor powerful for demanding cuts and large branches. Uses a low-kickback bar and chain for enhanced performance. Tool-free chain tensioning for fast and easy chain adjustments. Users will enjoy the convenient automatic oiling system for chain and bar lubrication with a monitoring window to keep track of oil levels. Q – How long is the cord? A – You need to purchase and use your own industrial/outdoor extension cord. I use the same 100-foot cord for all electric lawn care equipment. Q – Does this have a 2 or 3 prong cord? A – The cord is two prong. 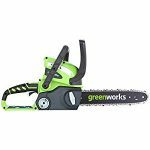 GreenWorks 20222 14″ Corded model is a handy dandy yard cleaner with a 9-amp electric motor that will begin cutting in seconds with reliable power. The tool-less chain tensioning provides the user with fast and easy adjustments for quicker jobs. Ergonomic with the wraparound handle and low maintenance with it’s no hassle automatic oiler to deliver adequate lubrication for the best cutting performance. Q – Is the Oiler adjustable? A – No. Factory set as it’s an automatic oiler. Q – Can the chain be removed? A – No. It comes with a blade cover. Chainsaws are built to power their way through some of the toughest cutting jobs. The Electric and Gas models have their special benefits which are why it’s best to find one that fits your specific needs. Check out the chainsaw buyer’s guide to help you find the right chainsaw for the money. 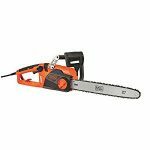 Electric chainsaws are built to be more economical and compact with a lighter feel giving the user a reduction in fatigue while being able to work much longer. Gas chainsaws are much larger in size, more powerful, and heavier for the toughest cutting jobs. Electric: Light tasks that involve cleaning up brush and pruning are ideal for an electric chainsaw. 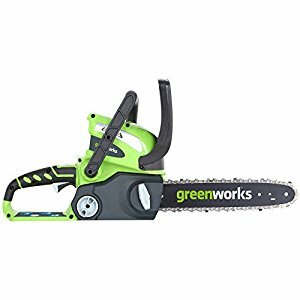 Gas-Powered: Cutting timber and much other tougher jobs will require the use of more power with a heavy-duty chainsaw such as a Gas-powered. Cutting bar lengths and engine size will determine the kinds of cutting tasks the chainsaw can accomplish. The cutting bar size can range from 8″ to 42″ Bars that are in the 14″ to 16″ range are ideal for light-duty and occasional use, while 18″ to 20″ cutting bars work ideal for large diameter cutting. Proper tension must be left on the chain to make sure of efficient operation, along with the chain being properly lubricated and sharpened. Many chainsaws provide the user with tool-free tension adjustments. Larger engines deliver more power and handle demanding jobs but can be more demanding on the operator’s body causing fatigue. Vibration dampening system – Reduces fatigue and extends the life of the chainsaw with the vibration isolator and dampening system.